Anthony Harris Art - Artist, South Africa. 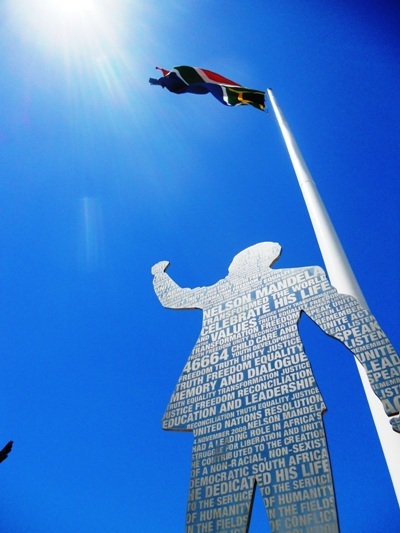 Anthony Harris was commissioned by the Madiba Bay Development Agency (MBDA) in 2009 to create a public sculpture that will be based at the drum of the Great Flag at the Donkin Reserve in Nelson Mandela Bay.- Port Elizabeth. 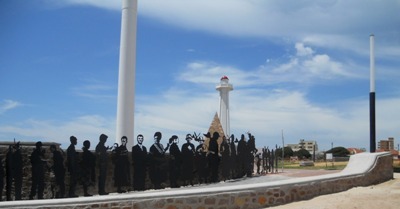 Konrad Geel, an artist and master CAD operator, was brought on board with his skills and collaborated with Anthony to complete the work in late 2010. 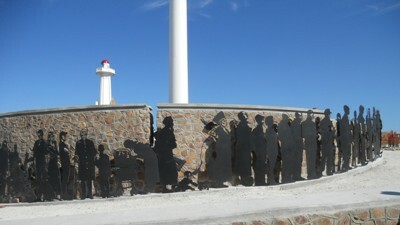 The sculpture took 14 months to conceptualise, manufacture and install. 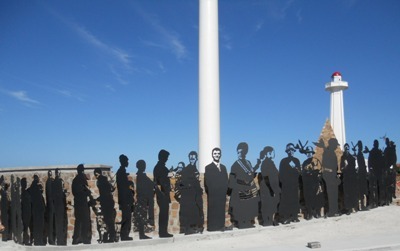 “Voting Line” is a life-size, 36.6 meter, 14 ton sculpture of laser cut steel figures which symbolises the long voting lines created by South Africans in the first, free democratic elections of 1994. 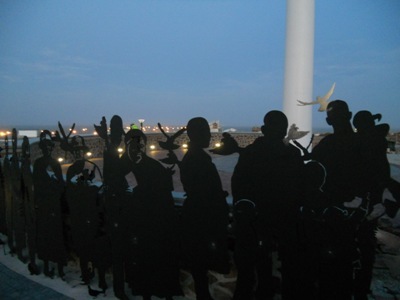 48 "character figures" from Nelson Mandela Bay where photographed and then captured in CAD format for laser cutting. 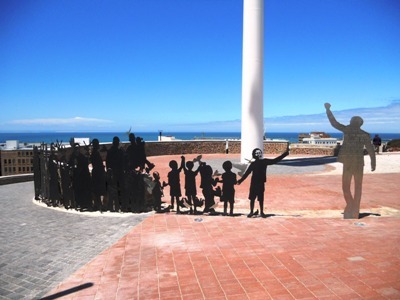 Voting Line is situated on the Donkin Reserve and forms part of "Route 67" - which will be an art / heritage route with 67 art works symbolising the 67 years that Nelson Mandela dedicated his life to service to the people of South Africa. 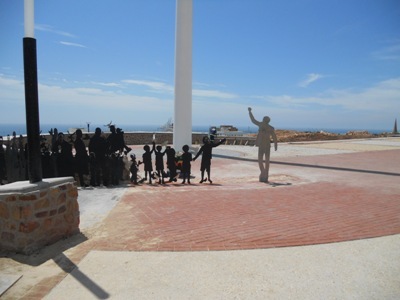 Nelson Mandela played a pivotal role in achieving this freedom. 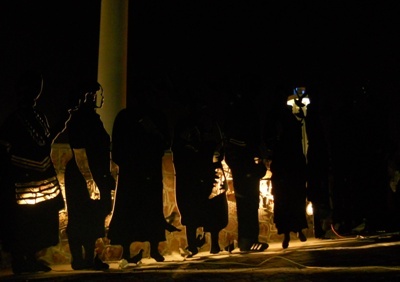 "Voting Line" symbolically “cocoons” the drum of the Great Flag. To further pay tribute to Nelson Mandela’s legacy, being devoted to children and the family unit, the artwork seeks to convey a sense of happiness and playfulness, but also capturing the seriousness of voting, through the steel figures’ postures. 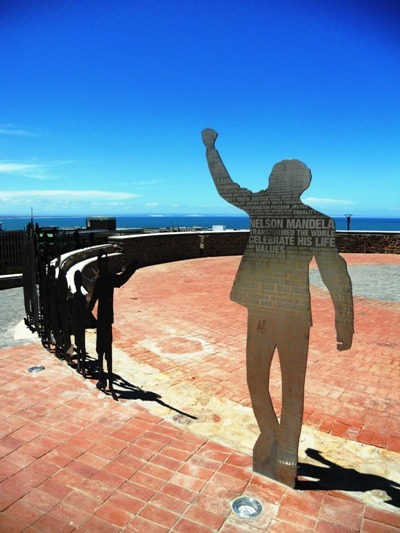 The first steel figure is the Nelson Mandela Trust Logo. 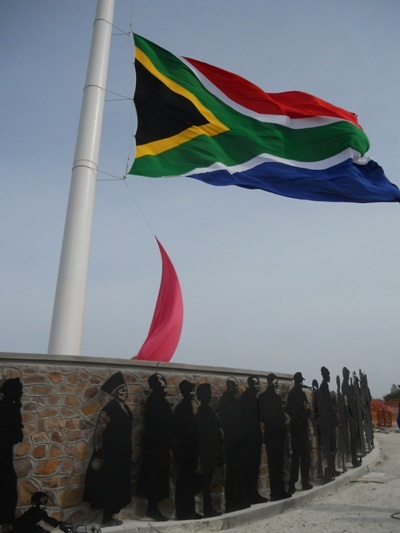 This is the fist time in the world that this logo has been used in a public sculpture, furthermore it is the first Nelson Mandela public sculpture to be erected in Nelson Mandela Bay.